Poorly specified and/or installed insulation can have a detrimental impact on ground floors. Rob Firman, Technical and Specification Manager at Polyfoam XPS explains the risks and offers advice on what products to choose.. If you’re a flooring contractor, how far would you go to demonstrate that you have correctly constructed a floor? Would you open it up to allow further inspection, knowing it would have to be made good again? What about opening up the floor, removing a sample of insulation, and trying to arrange with the manufacturer to have it tested to show the method of installation was not detrimental to its thermal performance? At this point, you may be wondering why you would need to go to these lengths if the floor had been installed correctly – and the answer is that you wouldn’t. However, these are the steps one contractor tried to take after they had constructed ground floors in a multi-unit residential development and omitted a crucial membrane layer below the rigid insulation boards. A concern was raised that the floors did not match the specification, and that the insulation layer could be adversely affected by moisture. Desperate to avoid redoing so much flooring work at their own expense, the contractor was willing to go to significant lengths to prove the performance of the insulation as installed. Unfortunately, with no standard method to check any measurement of thermal performance against, it would have been impossible for any test results to be recognised or accepted as accurate. This is just one example of the many errors that can occur in the construction of ground floors. Genuine mistakes can, and do, happen, but there can be other reasons behind an incorrect floor which can be difficult to pinpoint. It could be the result of poor specification in the first instance. It could be due to misreading the specification, or not reading it at all and ‘doing things the way we’ve always done them’. In some cases, the specification may have been read correctly but an unsuitable product substitution offered or made for one of the floor’s layers. Or the errors could simply stem from the contractor not being up to speed with current floor construction practices. But whatever causes an error in a floor construction, poorly specified and/or installed insulation is a significant concern, and should not be allowed to remain just because taking up the floor is considered inconvenient. At worst, this could result in a failure of the floor. At best, it could mean the floor is sound but its intended U-value is not met – a risk that some in the industry seem willing to accept, even though it could rightfully be deemed not to comply with building regulations. For a flooring contractor, distinguishing clearly between different types of rigid insulation for ground floors may seem unnecessary. Some may assume the difference is minimal, but in fact, these products can be very different. There is also a misconception that a more thermally-efficient insulation offers better performance in other respects. It is assumed that the product with the best thermal performance is typically the most expensive, so must also be the strongest. But that is not the case. Different rigid insulation boards offer different combinations of characteristics. Some are more thermally efficient but unsuitable for bearing high structural loadings. Insulation materials with a higher compressive strength may need to be slightly thicker to achieve the required U-value but are more robust and tolerant of harsher environments. 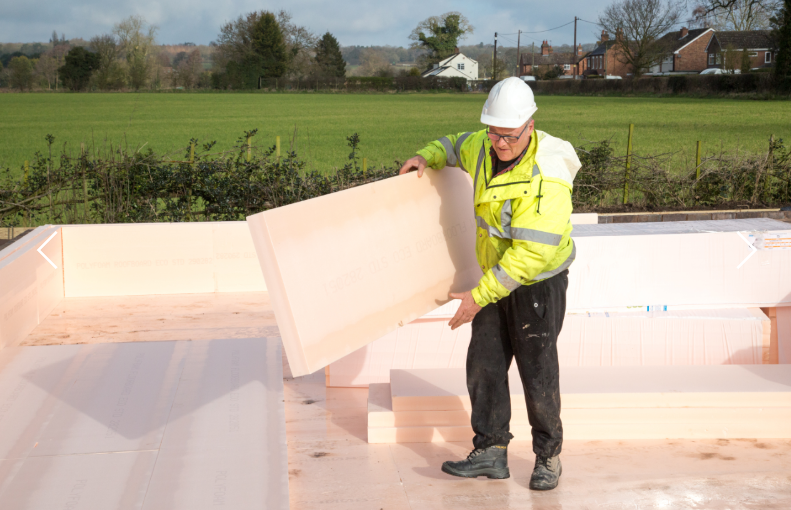 Extruded polystyrene (XPS) insulation is one of the most common types of rigid board, but uniquely, it can be used in damp or wet environments without affecting its thermal performance. It can be laid directly on prepared ground, with the damp proof membrane laid over it also acting as the separating layer between insulation and concrete – a saving of both time and membrane material. In addition, its high compressive strength makes it ideal for installing below concrete floor slabs, to the outside of basement structures and – where required by national building regulations – surrounding swimming pool basins. As a flat, strong and dimensionally stable insulation layer, it can also be used under floating floor coverings like screed or chipboard, above the ground floor slab. Alternatively, when used below raft slabs in residential and other low-rise buildings, XPS helps to enclose the building structure within the thermal envelope, reducing linear thermal bridging at junctions between construction elements, and achieving a greater level of building performance, comfort and energy efficiency. Project quality and building regulation compliance depend on using the right material in the right situation. That’s why dispelling misconceptions about floor insulation is so important and why contractors must understand the qualities of the various types. Installing the ‘wrong’ insulation board may seem like a small risk, but the impact could be bigger than you think. At a time when the construction industry is being scrutinised on how it delivers projects, such a risk should not be an option. It is vital that contractors understand the floor insulation they’re purchasing and install it correctly. Not only will this prevent the need to open up completed work but raise quality standards and ensure installers don’t have to resort to desperate measures because they didn’t get it right first time. Next PostNext WHAT IS BS 6229:2018?